We see the same sales tale. You’ve got a list of dream clients — the “golden accounts” for your firm. You’re navigating deep into their org charts, building relationships with the right people, and generating meetings with the right stakeholders and decision makers. But, it isn’t long before these golden accounts start taking a large chunk of you and your sales team’s time. You’re finally seeing success, but at the opportunity cost of missed follow-ups and engagements with other potential clients. Retargeting and outreach dwindle, and lead sourcing begins to diminish. The result: money‘s left on the table! Most sales teams rightfully prioritize navigating key accounts and working with qualified opportunities. That’s where a sales team’s strengths lie — relationship building with the right people and guiding people through the value proposition of your product. But, they usually have a much larger addressable market to tackle, what we call the “long-tail”. This is the idea that the vast majority of business opportunities lie outside of the golden accounts your sales team is focusing on. Maybe you have 200 golden accounts that your sales team is focused on, and maybe you have an addressable market of 20K, 200K, or 2 million other accounts your team could target. It’s difficult to cover 200K accounts effectively; there’s a lot of coordination and work involved here. And at a certain point, hiring more sales folks to tackle this market doesn’t yield healthy ROI. Additionally, each additional sales rep on average produces diminishing results, meaning that at some point it really doesn’t make sense to hire more reps! How Do You Tackle the Long-Tail? Prioritize — Are you currently focusing sales resources effectively? Are there more lucrative tools and tactics that you could be using? Analyze — What’s your perceived ROI per salesperson? How does ROI diminish per sales head? 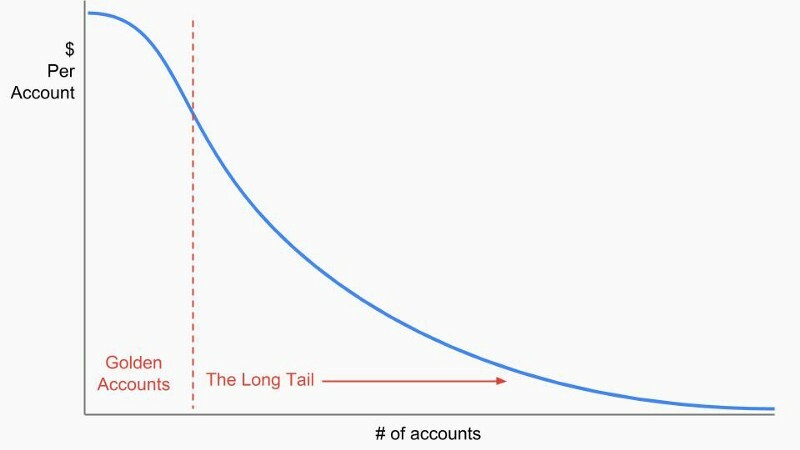 Assembly-Line — How can you engage with the long-tail effectively? What’s the best way to engage with this market at scale? How can you build your own assembly-line to set up your team with qualified opportunities? ScaleRep empowers clients by surfacing opportunities and set meetings from the long-tail of accounts firms work with. We do this by managing and automating smart outreach across multiple channels on your team’s behalf. Our clients love working with us because ScaleRep effectively sets up conversations with interested customers while freeing up 20+ hours for teams to focus on golden accounts and building relationships with the right people. Want to be part of the smart-sales movement? E-mail us at info@scalerep.com, or book a demo today!